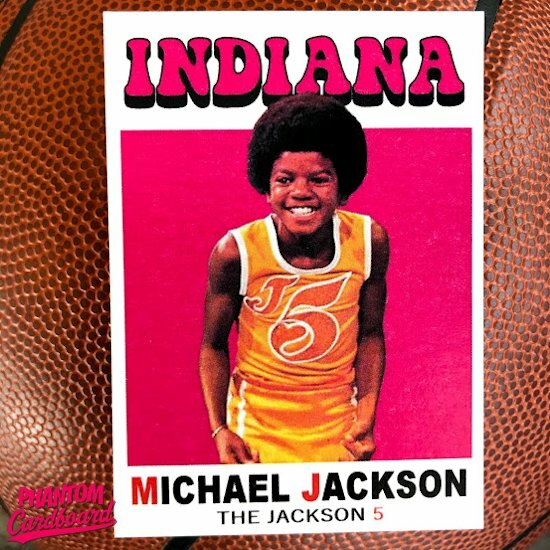 I came across this picture of The King of Pop and was pretty certain it would make for a fun basketball card. The image is from the Jackson 5's television special that aired on ABC in 1971 and was entitled Goin' Back to Indiana. The television special featured comedians Bill Cosby and Tommy Smothers, singers Bobby Darin and Diana Ross, football players Roosevelt "Rosey" Grier, and Ben Davidson, and basketball stars Bill Russell, Elgin Baylor, and Elvin Hayes. There was also a soundtrack album released from it. Being that we're talking 1971, I got another opportunity to use my funkiest design, the one inspired by the 1971-72 Topps basketball set. It's one of my favorites. This was the third card I've done in this style, but only the first where I got to use a color photo. Truth be told, I kind of like how the black-and-white photos contrast against the solid colored rectangle. 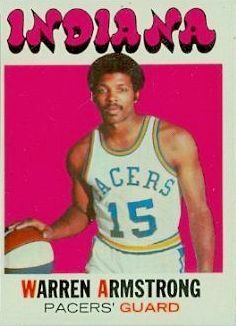 For the color scheme I matched it to the Pacers cards from that set. Easy choice, right?